The West Side Anglers High School Fishing Team offers a variety of experiences to its members from expert to beginner. Their mission is to help promote the sport of high school bass fishing and they seek to encourage its growth with all of their endeavors through education and conservation in the natural state. As a member of the club, student anglers are eligible to participate in several school, and extra-curricular activities unique to the club. From field trips to fundraisers, conservation projects, and even the opportunity to stand on the stage at one of the scheduled Student Angler Federation TBF events. That's right! Dedicated members that are willing to put forth the effort and have the necessary skill have the opportunity to compete on a scheduled fishing tour, as well as other events including state, national, and world level bass fishing tournaments. In its third year now, the program has seen a tremendous amount of growth in popularity and community support. According to coach Devin Carr, the utilization of Greers Ferry Lake for such activities by area schools has long since been overdue as High School Fishing has now become the fastest growing outdoor sport in America according to national federation sources. He encourages lake area schools to contact him for ways to help start more fishing clubs at schools in the area. "We currently have about twenty student anglers in our program sponsored by around forty business locally and across the country. Students are no longer just competing for bragging rights, they are competing for thousands of dollars in scholarships and the opportunity to compete at a collegiate level after high school. Something like this is a game-changer for all sports and athletic programs when a student can win upwards of $10,000 in one day by catching a few fish." In their most recent outing held over the weekend of October 14-15, the West Side Anglers competed against High School Fishing teams from around the state on Greers Ferry Lake in a tournament put on by the Arkansas Youth Fishing Foundation tournament trail. There were 70 teams in total at the event ranging from all areas of the state from Ft. Smith, to Texarkana, to far North and East. 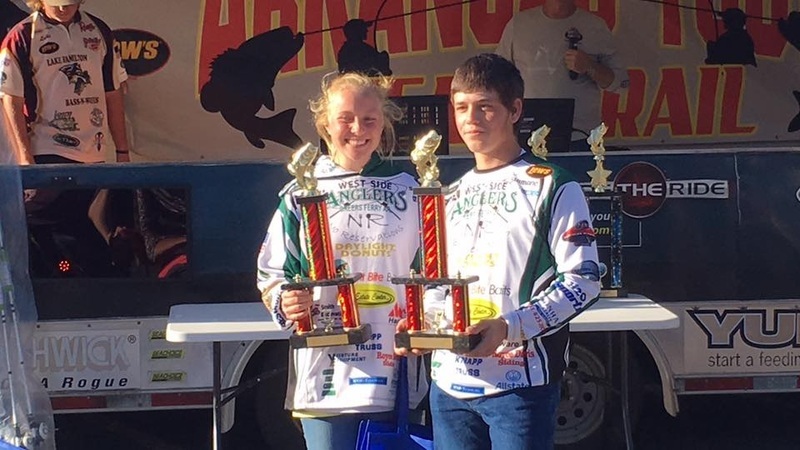 West Side's top finisher, returning team of the year comprised of Maci Parks and Andrew Turner, sat on the hot seat at the top of the leaderboards for much of the weigh-in before being ousted to a second place finish on the day by just a few ounces. Maci and Andrew are following the lead of their boat captain, Chad Parks, a seasoned veteran tournament fisherman and father of Maci and C.J. Parks. Pictured: Maci Parks and Andrew Turner with their 2nd place trophies.